Packter Viewer requires a standard Windows environment and Microsoft XNA runtimes. For compiling PACKTER source files, it also requires Visual C# 2008 and Microsoft XNA Game Studio 3.1. The command line options for Packter Viewer are as follows. All options can be omitted. Specify the size of flying objects, higher than 0 and less than 20. Specify the text reading software. Specify the object file for the packet sender board. Specify the texture for the packet sender board. Specify the scaling factor for the packet sender board. Specify the object file for the packet receiver board. Specify the texture for the packet receiver board. Specify the scaling factor for the packet receiver board. The supported file format of the object file is Direct X Format. 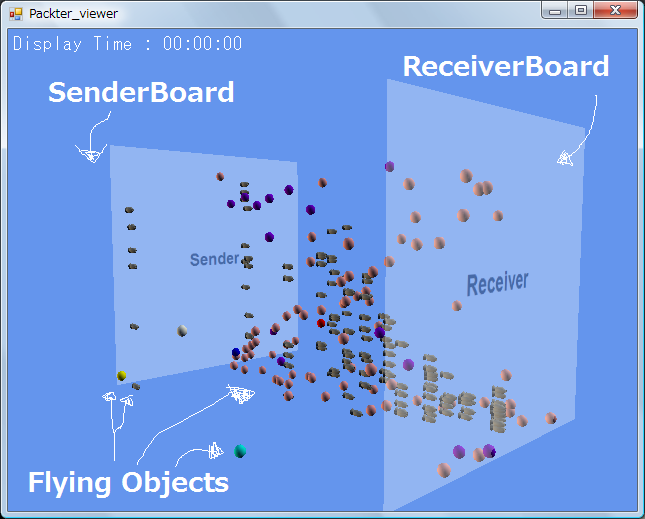 Packter Viewer accepts key input to control. The list of keys are as follows. Changing the point of view. Setting the time as the current time. Drawing a frying object randomly. Drawing some flying objects randomly. Rotating the point of view automatically. To enhance the feature of Packter Viewer, placing following applications and/or files is availab.e. Call softtalk/softtalkw.exe when receives PACKTERVOICE comamnd. See also Agent Configuration. Customzie the textuer of flying objects. Customize the model data of flying objects. If .x file is found, pacter01.png - packter10.png are ignored. To play sound effect and/or BGM files, set wav files in the working directory.